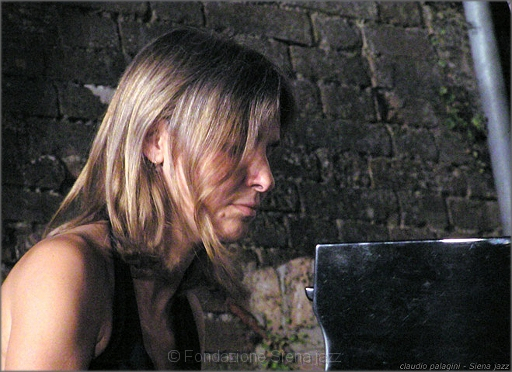 Marvi La Spina, arranger and pianist, in 1997 she established "Macchina di Suoni Jazz Orchestra". With this group she recorded the CD "Oboe Sommerso" for the record label "Dischi della Quercia". She gained a first in her Diploma for Classical Piano at the "Bellini" Music Conservatory in Palermo, and attended various specialisation courses, Marvi has been the Winner of International Competitions in Jazz Composition in both Barga (Lucca) and Sassari (2000). She has worked together with Mario Raja and Bruno Tommaso in the Lighea Group, and with other groups and projects for orchestra. She has performed in various Jazz festivals including: Siena Jazz, Stresa Festival and Maggio Musicale Fiorentino Festival, as well as the European Jazz Festival of Izmir (Turkey). In 2005 she was chosen as the "Invited Resident Composer" of the Art Omi International Arts Center, New York. On many occasions, Marvi La Spina and the Macchina di Suoni Jazz Orchestra have performed for leading Sicilian Concert Associations. Of particular significance was her collaboration with the American pianist and composer David Kikoski, a guest of "Macchina di Suoni" during the summer of 2011 and 2012.